...that Savathûn already breached the Solar System, so that she could visit Riven? ...that Nessus is a Vex machine world? ...that a Warlock's Nova Bomb Super can hurt or even kill the user if it detonates in close proximity? ...that despite being billed as a recurring PvE event comparable to the Iron Banner's role in PvP, Queen's Wrath only occurred twice? ...that Destiny is an FPS with both RPG and MMO elements available on the Xbox and PlayStation platforms? 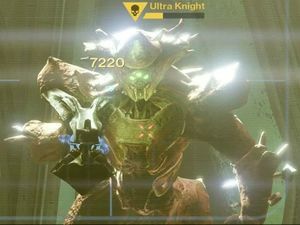 Ultra Knight is a unique Hive Knight encountered in The Bridge while patrolling the Dreadnaught. Killing him awards the Silent Scream Emblem. The Ultra Boss is the second boss to be unnamed, the first being the Ultra Captain, and the third being Ultra Hydra. In addition to this, the Knight is the first hidden Ultra in Patrol to not require any glitching to be fought. Destinypedia's pages can be edited.